Come to think of it, the trailer makes you believe that the debutant director is sure to spring a couple of surprises, but the predicament is DISHKIYAOON is marred by a laborious screenplay that doesn’t seem to go anywhere. There’s a twist in the tale towards the final moments of the film, but barring this sequence as well as the emotional outburst by Harman, the film doesn’t really work. In addition, like most first-time efforts, the substance takes a backseat, while style takes precedence here. Ideally, it should’ve been the other way around. On the whole, DISHKIYAOON misses the mark! Since the drama is not engaging or engrossing, it becomes a task for the audience to keep track of so many different sub-plots and tales. Another minus point about the film is that most of the characters are evil and/or indulge in illegal activities. This makes the film quite unpalatable for the womenfolk and the family audiences.On the whole, Dishkiyaoon is a dull fare and will, therefore, bomb at the box-office. It will entail heavy losses to all concerned. The boy too has no remorse about choosing a life of crime. Almost making it seem like he has chosen candy. Though he is born middle-class and respectable, he happily apes Rocky, Tony, Khaleefa and such others. Please note, none of the mafia dons instill fear, nor do they endear. They just talk, shoot and then talk some more, lulling you into sleep. For an action thriller, the narrative pace is so languid, you can take your popcorn and pee break between the times when two bullets are fired. When a film is called ‘Dishkiyaaoon’, you know that the people involved with it were clueless about what to name it. Two and half hours later (the running time of the film), I’m equally clueless about many things, but mostly this: just why was it made? A gangster flick with a complement of dark, twisted characters and a plot burdened with an overload of twists, Dishkiyaoon is high on style but low on substance.In Dishkiyaoon, there isn’t a single figure that springs out of the too-clever-by-half but essentially vacuous screenplay and imprints himself on the mind. This is Shilpa Shetty and Raj Kundra’s first production and they should have come out with all guns blazing. Sadly, the fireworks stop with the name of the film. The comic punches in Dishkiyaoon are too few and far between, plot twists make little sense and are saddled with glaring loopholes. The film’s climax will take you by surprise. Which is not to say that it’s a well-made thriller. It just means that you got so engrossed in trying to make sense of this haphazardly put-together story, you didn’t have much time to realise there’d be the big reveal at the end of it for you to apprehend. Debutant director Sanamjit Talwar’s ‘Dishkiyaoon’ is a lethargic attempt at a story centering around the murky affairs of Mumbai’s outlaws. The sluggish narrative over the first hour shifts between the past and present as we learn of how Viki abandons his Gandhian father to adopt the life of a criminal. So while the plot introduces us to many villains, each more annoying than the other, they all endorse the principle that to succeed in the underworld, one must create a “rumour” about their heroics. The lack of a coherent plot and an unimpressive cast only adds to his downfall. This mobster drama, touted as Baweja’s comeback vehicle after his 2009 debacle What’s Your Rashee?, is laughable and unintentionally funny. The gangsters in this drama speak in rhymes and riddles. These wannabe wiseguys pull the trigger only after delivering a pompous line or two. What redeems this film is the eventful pace. There’s gang wars, drugs being smuggled from Iran and copious tears shed during heartbreak (yes, gangsters have hearts too). Sadly, this viewer had reached a stage where she was beyond caring. 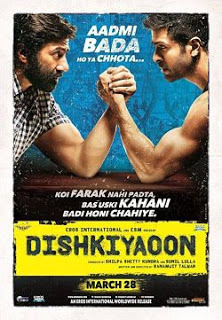 Dishkiyaoon is a film that is at best can be described as convoluted mess. Told in a linear fashion, the film is flat. With nothing alluring or inspired in the movie, teamed with bad music and worse acting, you absolutely must give this film a miss for your own good. Just a bad Friday, let it pass.